Introduction: Fingerprint analysis for personal identification is well-known, as it is unique to all individuals and remains unchanged over a lifetime. Now it is getting identified as a useful tool in understanding the basic questions in genetics and is emerging as an independent field in dentistry as dermatoglyphics. Aim: The aim of this study is to assess if any relationship can be established between fingerprint patterns with dental caries. Materials and Methods: A total of 76 dental students aged 18–26 years were selected using simple random sampling. Their fingerprints were recorded with duplicating InkPad and analyzed by Cummins Method and caries experience was clinically assessed by decayed, missing, and filled teeth index. Results: The dental caries experience was highest among students with whorl pattern (μ = 2.82) followed by the central pocket loop (μ = 2.60) and least among students with loop pattern (μ = 1.58). 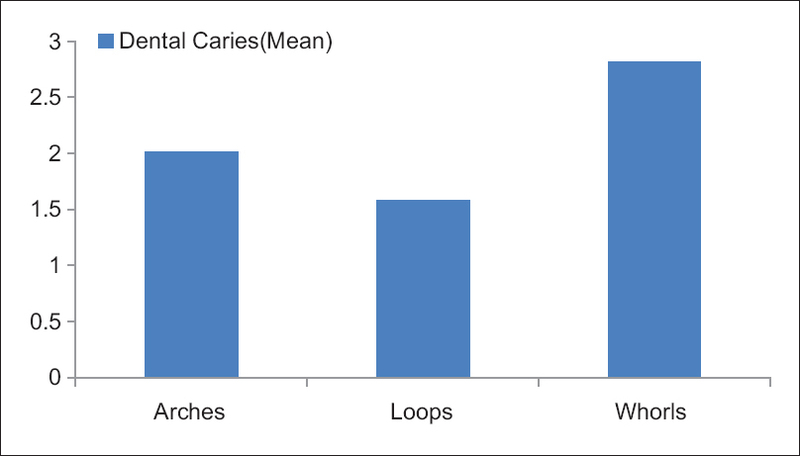 Furthermore, a significant relationship between twin loop pattern and dental caries was noticed (μ = 2.41); however, a negative correlation was observed for loops and arches with dental caries. Conclusion: The dental caries experience of an individual was associated fingerprints. Dermatoglyphics may be considered as a indicator of dental caries in humans. The study of the human hand has always been fascinating, not only to anthropologists and physicians but also to psychologists, writers, painters, sages, and chiromancers. The term “fingerprint” predominantly means an impression of the epidermal ridges of the fleshy distal portion of a finger formed by applying ink and pressing the finger on paper and is used as means of establishing identification. Study of fingerprints is known as Dermatoglyphics. Dermatoglyphics is considered to be a window of congenital abnormalities. It is a sensitive indicator of intrauterine anomalies both dental as well-systemic and known to be one of the best available diagnostic tools in genetic disorders. Genetics and environmental forces play asignificant role in the development of an individual's fingerprints. The development of dermatoglyphic patterns begins to develop in the 6–7th week of gestation and is complete by the 20–24th week of gestation. The dermal ridges develop in relation to the volar pads, which are formed by the 6th week of gestation and reach a maximum size between 12th and 13th weeks. This means that the genetic message contained in the genome-normal or abnormal is deciphered during this period and is also reflected by dermatoglyphics. The dermatoglyphic analysis is now beginning to prove itself as an extremely useful tool for preliminary investigations into conditions with a suspected genetic basis. In many respects, it has been used as an adjunct to other disciplines, serving as a vehicle to resolve broader biomedical problems. The basis of considering dermatoglyphic patterns as a genetic marker for dental caries is that the epithelium of finger buds as well as epithelium of primary palate and the enamel (most susceptible tissue to dental caries have an ectodermal origin, and all develop at the same time of intrauterine life. Thus, when an intrauterine dermal damage occurs, naturally a tooth anomaly should be expected., As dermatoglyphic patterns stay constant during life so it may sometimes play a significant role in the diagnosis of dental diseases such as dental caries. Hence, a study was undertaken with an aim to investigate and analyse the relation between dermatoglyphic pattern variations and dental caries among a group of dental students. The objective of this study is to suggest if the dermatoglyphics can be used as an indicator for dental caries much before its initiation giving an opportunity to take preventive measures to stop it. This is a descriptive, cross-sectional study conducted on a group of dental students in a Dental College in Bhopal City. The study was conducted for 2 months between April and May 2012. Ethical clearance was obtained before study from the ethical review board of the institute. Permission obtained through informed written consent forms from students before recording the fingerprints. The sample size was determined by a pilot study done in the same group for the prevalence of dental caries which was found to be 60% with the formula μ = Z2pq/e2. A total of 76 students aged 18–26 years were selected using simple random sampling. Students with skin disorder or who having any developmental anomaly or any trauma to fingertips were excluded from the study. Before the study, the examiner was trained and calibrated in the identification of fingerprint pattern by the faculty of forensic medicine. For collection of data, a pro forma was used consisting of demographic details, brief case history regarding sugar consumption, oral hygiene methods and fluoride exposure, fingerprints and recording format of decayed, missing, and filled teeth (DMFT) index. A4 size plain paper, cotton, stamp pad, soap, gloves, magnifying lens, scale, protractor, micro tip pencil and eraser, oil, and case sheets were used as armamentarium Procedure for recording Finger Prints and Dental Caries: InkPad Method was used to record the fingerprints of subjects. The subject's hands were cleaned with soap and water and then scrubbed thoroughly with an antiseptic lotion (Savlon) and allowed to dry. This was done to enhance the quality of the dermatoglyphic prints, by removing sweat, oil, or dirt from the skin surface. The student's right palm was pressed in the ink pad followed by pressing it firmly against the bond paper 2–3 times; since, the second or third recording was satisfactory and readable [Figure 1]. The same procedure was repeated for the left hand. 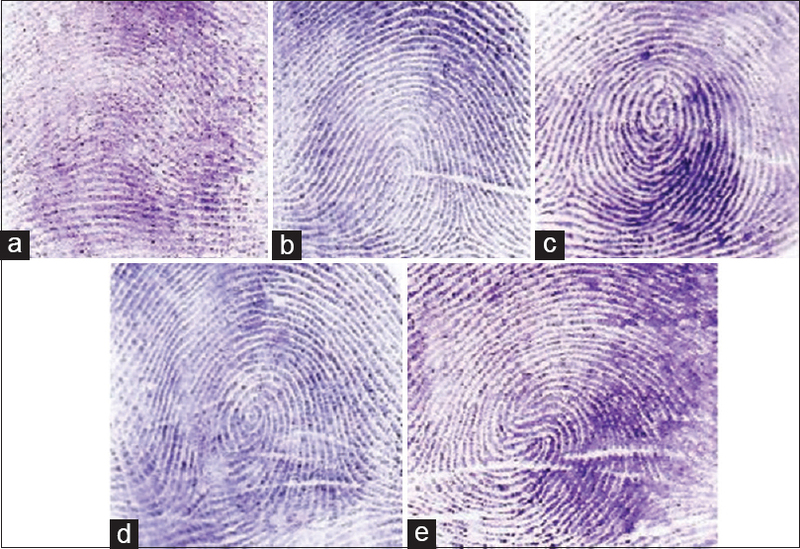 Prints were dried and studied with the help of fingerprint expert using a magnifying lens (×10) to identify and obtain the dermatoglyphic patterns of fingertips. After taking the imprints of all fingers, ink was removed properly. Care was taken while recording the prints to apply the stamp ink material in adequate amounts. Dental caries was recorded using probe and mirror and caries experience of students was measured using DMFT index. The collected data were entered into Microsoft Excel 2007 and subjected to statistical analysis using IBM Corp. Released 2011. IBM SPSS Statistics for windows, Version 20.0 Armonk, NY: IBM Corp. The fingertip patterns were classified and analyzed using Cummins and Midlo method of Fingerprint identification. The results were evaluated by Pearson's correlation coefficient tests to assess if the prevalence of dental caries increases with the increase of particular dermatoglyphic pattern. The level of significance was kept at P < 0.05. A total of 76 students were included in the study; of which, 58 females (76.31%) and 18 males (23.68%) participated. The mean age of students was 21.60 (1.58) years. Among all the loop pattern was found among 50 students (66%) followed by whorl pattern among 21 students (28%) and only 5 students (6%) having arch pattern [Table 1]. Prevalence of dental caries was highest among students with whorl pattern (mean = 2.82) compared to other patterns of fingerprint whereas the students with loop pattern shows lowest prevalence of dental caries (mean = 1.58) [Table 2]. This result came out to be statistically significant (P < 0.05) [Figure 2]. Among the subtypes of whorl pattern of fingerprint, central pocket whorl and twinned loop found to have a maximum prevalence of caries [Table 3]. The correlation test revealed that there is a significant relationship between whorl pattern and dental caries (0.33) indicating an increase in whorl pattern with an increase in dental caries whereas loops and arches found to have a negative correlation with dental caries [Table 4]. Dental caries is a microbial disease of the calcified tissues of the teeth, characterized by demineralization of the inorganic portion and destruction of the organic substance of the tooth. It is a chronic, complex, multifactorial disease for which a multitude of etiologies such as host and environmental factors have been proposed. It is critical to realize that genes and environment do not act independent of each other and the appearance or magnitude of heritability may differ with various environments. The pattern of dental caries has been found to be similar in members of the same family over several generations and hence, inheritance of this susceptibility is suspected. Genetic variations in the host factors may contribute to increased risks for dental caries. In this study, the dermatoglyphic patterns varied significantly among the subjects. The whorl pattern of fingerprint was found to be more prevalent in students having the highest mean of dental caries (2.82). The findings of this study found to be similar to the studies conducted by Vijender et al., Madan et al., and Sengupta et al., which showed a significant change in the dermatoglyphic pattern between the caries and the caries free group and reported frequency of whorls more in caries group and the frequency of loops more in caries free group. In this study, central pocket whorl and twinned loops were found to have maximum caries among the whorl pattern that has not been reported by any other studies till now. The results of this study are in contrast to the results obtained in the study done by Madhussudan et al. and Agravat et al. wherein prevalence of dental caries was highest among students with loop pattern compared to other finger patterns. As per our study, there exists a statistically significant relationship between whorl pattern and dental caries. The whorl pattern and dental caries were positively correlated (r = 0.33) (P = 0.002). Thus, with an increase in the whorl pattern, there was an increase in dental caries. However, a negative correlation was observed for loop pattern (r = −0.25) (P = 0.031) and dental caries. Thus, with an increase in the loop pattern, there was a decrease in dental caries. The results obtained were similar to the study conducted by Abhilash et al. Thus, the susceptibility for dental caries due to an abnormality in the tooth structures like alterations in the structure of dental enamel, tooth eruption and development may be reflected in the dermatoglyphics, namely, whorl and loop patterns., Hence, dermatoglyphics could be an indicator of to assess the susceptibility of an individual to dental caries. The use of stamp pad ink in recording fingerprint has also got certain disadvantages. The imprint is affected by the amount of pressure exerted while the palm is recorded. Therefore, care must be taken while recording the prints to apply the ink material in adequate amounts. A thin or thick application results in light or dark improper prints. The study has been carried out on very limited number of participants. We recommend more comparative studies with larger samples between individuals with or without dental caries to establish a relationship between dermatoglyphic pattern variations and dental caries. In this study, central pocket whorl and twinned loops were found to have an association with an increase in dental caries experience. There is a definite correlation between fingerprint patterns and dental caries. Thus, the dermatoglyphics gives a hope in the prediction of dental caries much before its initiation giving a sufficient time to implement preventive measures. In a developing country like India, it might prove to be a noninvasive, inexpensive, and effective indicator for dental caries. Naffah J. Dermatoglyphic analysis: Anthropological and medical aspects. Bull N Y Acad Med 1977;53:681-92. Gyula G. A short history and some results of the dermatoglyphics studies in Hungary. Acta Biol Szeged 2000;44:135-8. Natekar PE, De Souza FM. Fluctuating asymmetry in dermatoglyphics of carcinoma of breast. Indian J Hum Genet 2006;12:76-81. Soni A, Singh SK, Gupta A. Implications of dermatoglyphics in dentistry. J Dentofacial Sci 2013;2:25-8. Kiran K, Rai K, Hegde AM. Dermatoglyphics as a noninvasive diagnostic tool in predicting mental retardation. J Int Oral Health 2010;2:95-100. Bhat Pk, Badiyani BK, Aruna CN, Chenagappa S, Bhaskar NN. Dermatoglyphics – A new diagnostic tool in detection of dental caries among deaf and mute children. Int J Clin Dent Sci 2011;2:80-4. Priya NS, Sharada P, Chaitanya BN, Girish HC. Dematoglyphics in dentistry – An insight. World J Dent 2013;4:144-7. Peter S. Indices in dental epidemiology. Essentials of Preventive and Community Dentistry. 4th ed., Ch. 13. New Delhi: Arya Publisher; 2011. p. 343-6. Hassell TM, Harris EL. Genetic influences in caries and periodontal diseases. Oral Biol Med 1995;6:319-42. Vijender V, Tarannum T, Pathak A. Dermatoglyphics interpretation of dental caries: An in vivo study. Int J Dent Med Res 2015;1:54-6. Sengupta AB, Bazmi BA, Sarkar S, Kar S, Ghosh C, Mubtasum H. A cross sectional study of dermatoglyphics and dental caries in Bengalee children. J Indian Soc Pedod Prev Dent 2013;31:245-8. Madhussudan K, Patel HP, Umesh K, Chavan S, Patel R, Gadhavi N. Relationship between dermatoglyphics, chiloscopy and dental caries among dental students of Visnagar town, Gujrat. Int J Adv Res 2015;3:952-9. Agravat D, Agarwal N, Patel P. Dermatoglyphics: A tool for dental caries prediction. J Adv Med Dent Sci Res 2014;2:66-9. Abhilash PR, Divyashree R, Patil SG, Gupta M, Chandrasekar T, Karthikeyan R. Dermatoglyphics in patients with dental caries: A study on 1250 individuals. J Contemp Dent Pract 2012;13:266-74.